The picture and data below come from 361 Capital. There are 28 large cap companies making new all time highs. 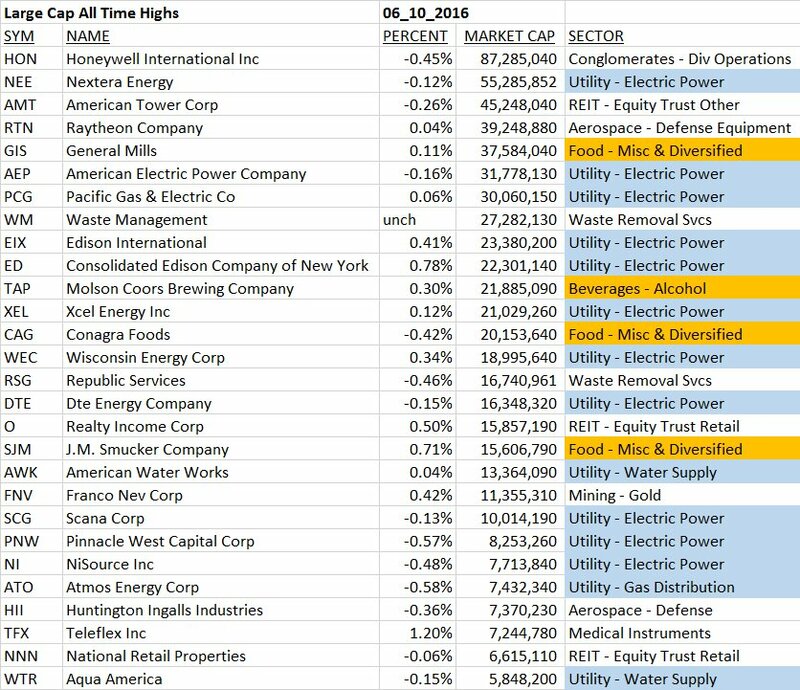 The list of large cap stocks making the most new highs is dominated by Utility and Staples sectors. Buyers and Sellers continue to bid these sectors up. Why is that the case? Could I come up with a few reasons, yes. I could even sort through data to support the reasons. But the WHY is much less important than the WHAT. The WHY is, and always will be, an unknown variable. The WHAT is more relevant, it’s what makes or loses investors money. Time is wasted on the WHY of markets – seeking out reasons for what’s happening. Those reasons are a moving target where the dots will never be perfectly connected, and remember, hindsight is always 20/20. You will be much better off as an investor when you can block out the noise and focus on the WHAT. Successful investing does not require the ability to predict. It requires the ability to adapt. Big difference. The price of a security going up or down is what increases or decreases your portfolio’s value. Valuations and fundamentals matter, but price is king. Buyers and sellers determine price, nothing else. We feel our time is much better spent researching buyer and seller behavior and how to capitalize on that than anything else. We aren’t interested in how smart our investors think we are, we are interested in our ability to help them make money in the markets. The need for a part of portfolios that can adapt to the WHAT of the market is critical in our opinion. Adapting in a rules-based fashion is a much better option than predicting with discretion. And again, simple beats complex.